It's HOW MANY Days 'til Christmas?! I resolve every year to start my Christmas cards in January so I don't get behind, and every year in the beginning of October, I start to panic as I realize that it's almost Christmas time and I still haven't made a dent in mu Christmas card stash!! Are YOU like that? 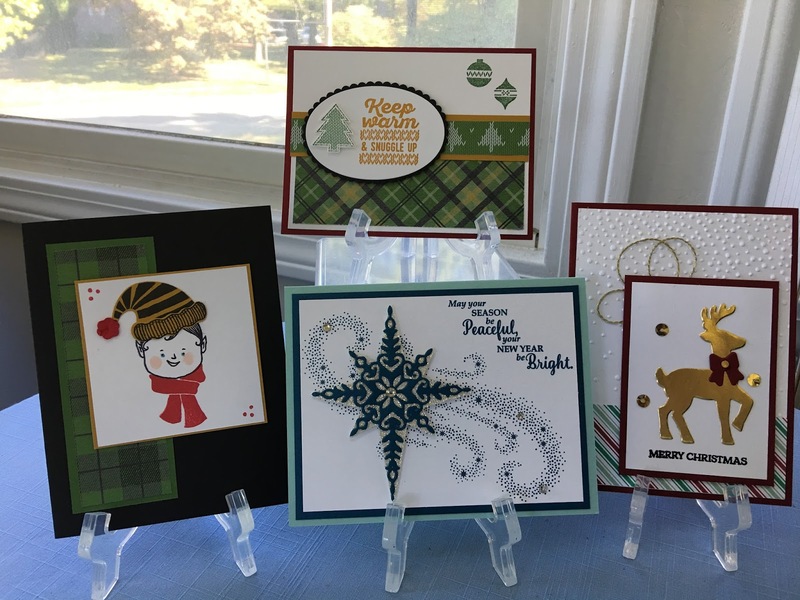 I did a Christmas-in-July card class, missed August, then started up in September with the different Christmas card offerings. I was involved in several different swaps with the new catalog, so it's been fun and easy to come up with cards for my classes. So many talented demonstrators and stampers out there! I find that many have a style that I like to imitate. Would you like to come to one of my classes? Leave me a comment if you'd like to come and you live in the Lynnfield MA area! Here is a link to my calendar of events.